Wine Vision, the CEO-level global wine conference to be held in London next week, looks like it will be an unusually interesting gathering because of the issues that have risen to the top of the wine industry agenda as a result of the recent Tescogate scandal. Tescogate? The scandal, for those of you who don’t follow UK retailer news, is that the big supermarket chain Tesco is reported to have used various financial manipulations to overstate its earnings by a whopping £250 million. The value of the company’s stock has come crashing down and high-level heads have rolled. Investigations continue. Tescogate has changed perceptions of this big retail chain among investors, consumers and regulators. 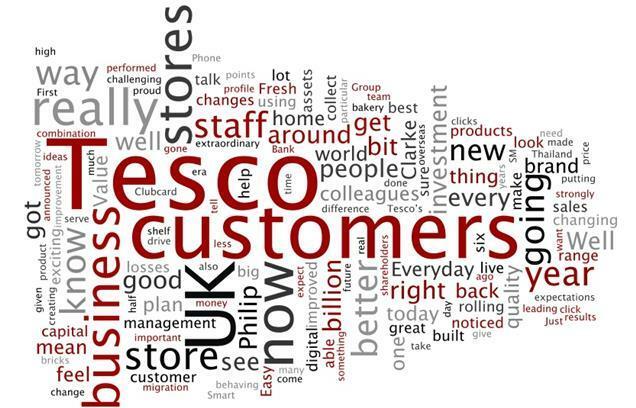 A “word cloud” of web references to Tesco today might look much different from the innocent image above that I found on the internet — maybe more like this one, which was created to display public opinion about bankers a couple of years ago. What do you think? Wine inevitably enters the Tescogate story because Tesco is the world’s largest retailer of wine and, although the wine program is not at the center of the investigation, the scandal has prompted many in the trade to give voice to long-held concerns. Their complaint is not so much accounting fraud as near as I can tell as a pattern of unequal relations between retailers and suppliers that is not just limited to Tesco and probably not just limited to wine either. The issue is power and it is something that was already part of my planned Wine Vision presentation when the Tescogate news first broke. I’m still trying to decide exactly how much attention to give it in my talk. A number of factors have shifted power in the global wine industry — away from those who make the wine in favor of those who can sell it. It’s not the first time that it has happened and its not just a wine thing, either. Because the wine gets sold a lot of people are happy for now with the situation. But power is power and you’ve got to pay attention to who has it, what kind and how it is used. 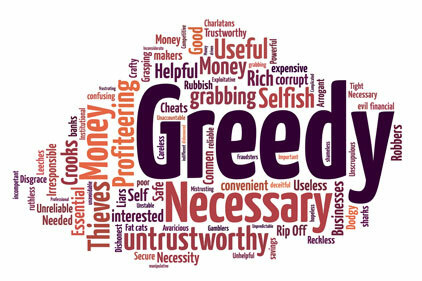 Fill in your favorite Machiavelli saying here! In my other life as a university professor I have often written about power. Power comes in many forms. Hard power is the ability to impose your will. Soft power is about influencing the environment in which choices are made. Relational power comes from your resources versus those of your opponent. Structural power comes from the organization of the system — the rules of the game — and the leverage that results. Tesco and other large-multiple retailers can be seen to have all of these types of power, but structural power is probably the most important. They write the rules of the game to an important extent. Because they are the gate keepers to the retail shelves, they really don’t need to throw their weight around to get lower prices and other benefits from suppliers. The suppliers will fall over themselves to make sure they stay in the game. Wine suppliers in many cases drive down their own margins because they are afraid that someone else will do so first to grab scarce shelf territory or private label bulk wine sales. Concerns among suppliers are not new, but there is a sense that people were previously afraid to speak out and the Tescogate scandal has created an opening where the issues of producer-retailer power (and not just about Tesco) can be more safely and openly discussed. And that’s a good thing. The Tescogate chatter has brought the concerns and frustrations of the wine suppliers to the fore and there is a lot to be learned from listening to the discussion. But then what? It looks to me like Wine Vision is shaping up an interesting place to see how the conversation unfolds because of the people on the program (including Tesco’s Laura Jewell MW) and the people in the audience. If there is every going to be an opportunity for an open discussion of the (un) balance of power in the wine industry, this will be it. In the blog? I have seen the style elsewhere. They are from the linked stories I mentioned, Brian. The first was from an interview with Tesco execs. The second image isn’t about Tesco — it’s from a story about bankers during the financial crisis. If you do a search for “word cloud” you’ll find programs that can make these for you. Found it…I need to read more carefully. I thought that Costco was the largest wine retailer in the world? No. Costco is the largest in the U.S. This year’s scandal, Tesco, will soon be forgotten due to next year’s scandal. Misleading investors is a grand tradition born immediately after stock markets were started. In more than 400 years misleading investors has never gone away. The next scandal may be different but it will arrive on schedule. Remember the 2008 Brunello scandal? Now it’s simply another footnote in the long history of adulterated foods and beverages. It will soon be studied in history courses with far less emphasis than Upton Sinclair’s The Jungle which led to the 1906 Pure Food and Drug Act and the Meat Inspection Act. The 2008 scandal followed the 1985 antifreeze in wine scandal which involved some Austrian wineries that had illegally adulterated their wines using diethylene glycol. Mike, this year’s scandal is only worth mentioning in context as part of a long tradition in the wine business and in every other industry. Most people are honest, but there are always some who aren’t. Interesting article given the stranglehold the supermarket duopoly has on wine retailing in Australia.